Lately, as many of you might have noticed, my blog has almost become an ad campaign of "vote Zetsuen no Tempest for best anime". While eagerly yet patiently waiting for the final chapters of Tempest, something else, something more powerful, more explosive, even though not nearly as glamorous, stepped in and stole my heart. Yes, you might have guessed it, (duh! 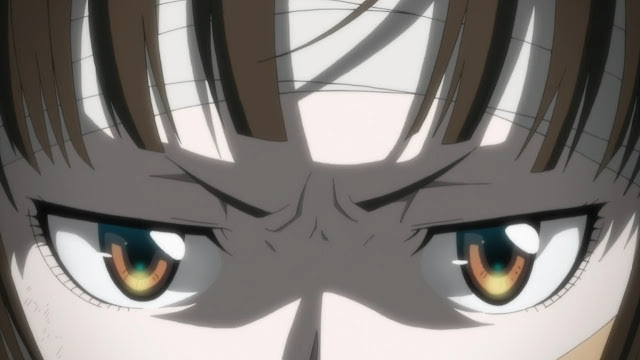 ), it's Psycho-Pass I'm talking about. Early on, Psycho-Pass strikes me as a more twisted version of the Ghost in the Shell. It's dark, it's twisted, and it's cruel. Honestly, I'm surprised I didn't start to like it sooner, since that's totally my taste for series that is not a moe sub-type. The script of the story is written by Gen Urobuchi, who is also responsible for the script for Madoka Magica, which if you haven't yet seen it, you should be ashamed of yourself. It actually explains quite a lot how Psycho-Pass feels like. It's the same kind of twisted hopelessness that encompasses you overwhelmingly with a futile feeling throughout. I think the turning point of the series for me, is when the integrity and legitimacy of Sibyl System is questioned. Then everything ripples out to set off an domino effect that rest of the story linked up like GitS did, though not nearly as intricate or deceptive. The story of Psycho-Pass raises the question about whether moral value can ever be measured in an absolute sense, objectively. And on top of that, it also questions whether the order of a human society can be kept without using subjective human judgement. Though the scenario is a bit overly simplified, and there exists the paradox how this system could be built at first place, they're mostly just minor mechanical issues that in my opinion can be overlooked as they don't really impact the main point it's trying make. Psycho-Pass involves quite a few major characters that are all very well developed where you'd grow very attached to them. When bad things happen to them, you can actually feel their pain, their anger, their hatred, and their sadness. The dark and suppressive color scheme and anti-moe art style just renders these feeling even stronger. Recommendation: I have to say, the ending is so explosive, that I almost just handed the best long anime of Fall 2012 award to it right there right then. But, then I remembered, three candidates, Zetsuen no Tempest, Shinsekai Yori, and Robotic;Notes are also in the running for the same award. I'd better wait till I see the end of them before I make any decisions. Fall 2012 was indeed a great anime season.